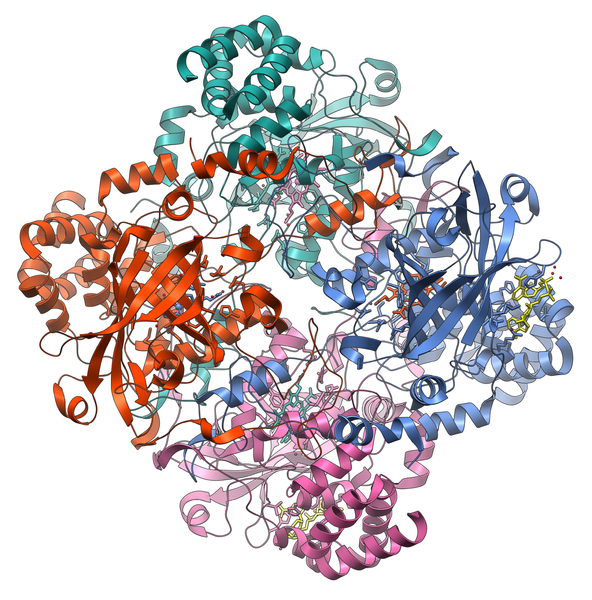 Catalase is an enzyme catalysing the decomposition of hydrogen peroxide into water and dioxygen. Catalases are found in all aerobic organisms, in the peroxisomes of eukaryotes. They are enzymes formed from four peptide chains, each composed of over 500 amino acids. They contain iron atoms within hemes, which are the active sites of the protein. The oxygen-oxygen bond of hydrogen peroxide is broken by the iron in the heme group, creating a molecule of water and a highly oxidising iron-oxygen bond. This can oxidise a new molecule of hydrogen peroxide giving dioxygen. The enzyme reaction involved is one of the fastest known. Within the cell, the catalase protects the organism from the harmful oxidising action of hydrogen peroxide.